We truly recommend the use of custom tarps and coverings for jobs where a standard square tarp cover will not work. Whether you are going to use it with machinery, heavy equipment or to storage boxes they can be made to order. With this type of cover, you can rely on its performance and a perfect fit which will surely provide what it is expected from it. When you have a custom tarps and covers they will fit perfectly rather than bunched up by using stock tarp covers. Also you can have numerous anchoring spots which will help to avoid any damage to your product from exposure to wind or unusual abrasion from the surroundings. 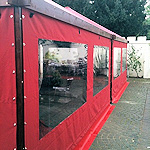 You can also choose from the indoor or outdoor product covers. The outdoor covers might need to be a little more specific, such as waterproof, and also resistant to the damage the exposure to the sun or other weather factors. Indoor custom covers are not exposed to the harsh conditions of outdoor use so they can generally be a thinner, less expensive material. Custom tarps and covers can also come in a variety of materials to match all the preferences each user might have. Perhaps you need to see the product or goods under the cover if so, you might use the clear tarps. Or maybe you don’t want it to draw too much attention, that’s when you can choose a completely opaque cover. Canvas tarps and covers, for example, will let your equipment breath, unlike solid materials. Let us know what are your needs. Contact us for more information on any indoor and outdoor custom tarps and covers.